Why You Can’t Store Sleep #Infographic ~ Visualistan '+g+"
Everyone loves sleeping in on the weekends, lounging around with your coffee, and then staying up late watching movies. Unfortunately your body doesn’t love it as much as you do. It turns out that your body needs a predictable and regular sleeping and waking schedule in order to be in harmony. Missing out on even an hour or two of sleep in a night will cut short some of your sleep cycles, thereby cutting down on the vital functions your body is performing during its sleeping hours. To put it another way, what do you want to miss out on- your body’s natural healing capabilities, turning your experiences into memories, or necessary daily relaxation? While it’s not always 100% possible to keep the same sleeping and waking schedule from day to day, maintaining it whenever you can will go a long way toward ensuring your continuing overall health. 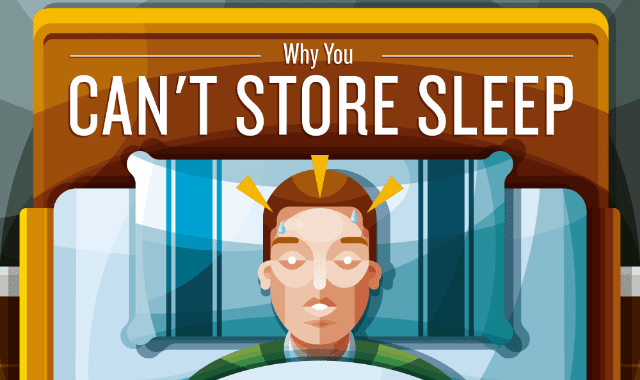 Learn more about why you can’t store sleep from this infographic!